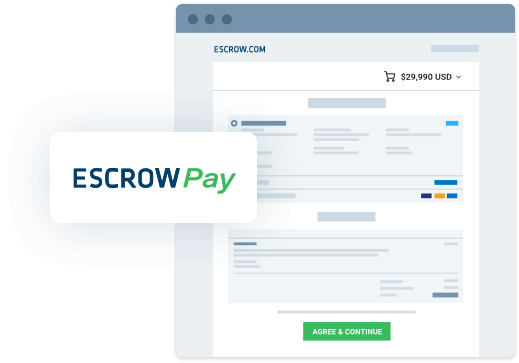 Escrow.com has introduced a new streamlined checkout payment system for the buying and selling of domain names, as well as cars, boats, aeroplanes… anything of value, with one line of code added to a website. The service is called Escrow Pay and has no minimum fee and prices as low as 0.89%. It’s being billed as the ideal solution for any website, mobile app, online store, classified site or marketplace that needs to take payments for any product or service of value. Escrow.com is ideal for transaction sizes from $100 to $10,000,000 or more. Escrow.com protects both the buyer and the seller by acting as a trusted thirty party holding the funds, allowing the goods to be shipped and inspected prior to funds being released. This means that valuable items can ship across state or country lines before the transaction completes, improving liquidity and access to global markets safely. Greater liquidity means sellers can access more buyers and buyers more sellers, resulting in better choice, pricing and transaction completion rates. For sellers, Escrow.com greatly increases trust & safety and reduces fraud and with no chargebacks, ever. Recent transactions secured by Escrow.com include the sale of 2 of the biggest premium domain names – crypto.com by famed cryptographer Matt Blaze and ice.com to the Intercontinental Exchange, the owner of the New York Stock Exchange. Escrow.com is also the payment system powering a wide variety of e-Commerce businesses including Shopify Exchange, Shopify’s marketplace to buy and sell businesses built on the Shopify platform, and Wingform, a marketplace for airplanes.